There are plenty of low maintenance shrubs that anyone can grow in their garden. However, there are certain factors that you must also take into consideration when choosing which plant to grow. No matter how self-sufficient a shrub is, but if it will not make your garden or landscaping to look any better, you will still not feel happy about it. So here’s a list of some of the best low maintenance shrubs that you can grow with less effort. This plant is actually a lemon flavored evergreen herb, which is a must have for the kitchen. It is often used in salads, marinades, etc. This herb does not require a lot of maintenance in order to thrive. It can grow up to 10 inches tall and about 12 inches wide. This attractive blue leafed grass can be grown in your garden with ease. It can potentially grow up to 3 feet tall and is a truly aggressive grower. The shrub can endure any type of soil conditions but the best thing about it is that it has no known serious pest problems. This is a highly prized tree that can be grown in your garden or lawn without a lot of maintenance. In fact, it only needs to be watered at least once a week in order to survive. The tree features beautiful upright branches that will form a dome shape once fully grown. This flowering shrub can grow up to a height of about 10 feet. Considered as one of the best flowering shrubs for full sun, the Pearlbush can survive drought and arid conditions. Furthermore, this tough shrub can adapt extremely well to a wide range of soil conditions. It produces beautiful white blossoms during late April and will add beauty to your garden in spring. This dwarf shrub resembles the shape of a globe once fully grown. It has a flat top and is often densely branched. Its bright blue needles give off beautiful blue colors all year round, though it tends to be brighter during summer. This plant is easy to care for and it’s highly resistant to deer and other animals. Thus, it is one of the best evergreen shrubs for front of house. Also known as the Goldflame, the Firelight Spirea is one of the most commonly grown shrubs when it comes to landscaping. It is mostly favored because of its beautiful golden leaves that shine even brightly under the sun. The plant does not require a lot of maintenance and is not a heavy feeder. However, it would help if you consider amending its soil with compost. 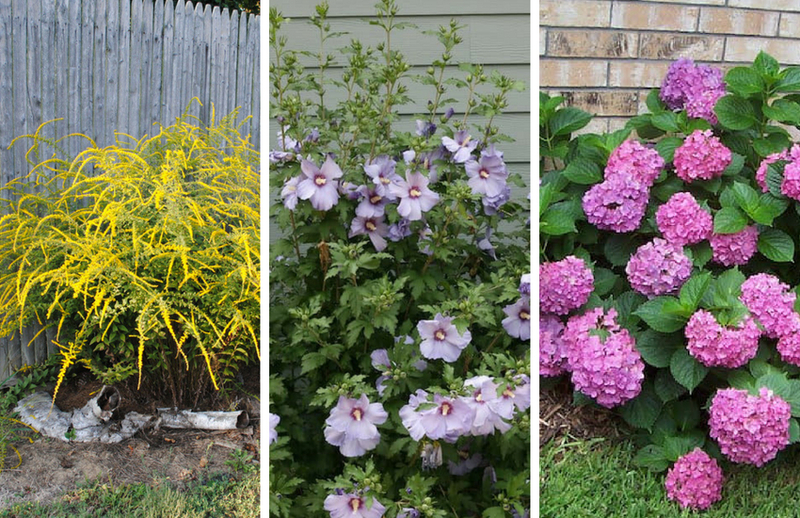 This is another low maintenance shrub that will give your yard lots of color. During late summer, this flowering shrub produces yellow sprays of tiny flowers. These flowers resemble the beautiful glow of fireworks, thus, the name. Aside from being extremely easy to grow, the shrub is also bee-friendly. Furthermore, it can thrive well in various soil conditions. This is another colorful shrub that requires only a little amount of care. Moreover, the shrub can grow well even on neglected areas. It is capable of growing up to 30 feet high during its maturity. Although this shrub would prefer to grow on well-drained soil, it can also thrive in infertile soil conditions. Thus, it makes for an excellent choice of plant for those looking for a low maintenance shrub to grow. This bush can certainly add a dramatic flair to your yard. It’s easy to grow and care for. Furthermore, the shrub enjoys growing under full sunlight. Thus, if you want to grow small flowering shrubs for full sun, this plant would be perfect! Its brilliant yellow flowers can certainly make your front yard to stand out. The Hibiscus is another flowering shrub that is known for being low maintenance. Thus, growing this plant is an easy way to enhance the look of your lawn. However, during their blooming stage, the shrubs will require lots of water. Furthermore, the plant needs heavy watering especially when the weather is warm. But once the weather gets cold, the plant will no longer need utmost care and watering. Although the hydrangeas are available in several different types, most varieties can be grown under full or partial sun. These flowering shrubs do not really require a lot of maintenance, but water is an important factor for their growth. These low maintenance shrubs would require deep watering once a week, especially when the weather is dry. The lavender is an easy to care plant that enjoys growing under hot and dry conditions. Thus, it is also the best choice of flowering shrubs for full sun. It is suitable for all kinds of landscape setting since it can thrive in various types of soil conditions. In fact, the shrubs can also thrive on areas that are prone to drought. The Moonshadow Euonymus is one of the best evergreen shrubs for front of house. This attractive woody evergreen vine is easy to care and maintain. Aside from the occasional pruning, there really isn’t anything to do for its maintenance. Some vines can crawl up to 70 feet high, and thus, pruning is necessary in order to keep them under control. This plant is known for producing suckers and colonies, and thus, it is a great choice of shrubs for mass plantings in your garden or yard. These semi-evergreen shrubs can reach up to 12 feet high on its maturity. When fully grown, the plant forms a bushy and rounded shape on those areas exposed under full sun. The best thing about these low maintenance shrubs is that they can withstand longer periods of drought. The oakleaf hydrangea is another variety of hydrangea bushes that is recognized by its foliage, which resembles that of an oak tree. The bushes can grow under shady areas, which make them very versatile. However, if you want it to produce more flowers, then you should give it a little more sun. Aside from being drought tolerant, the oakleaf hydrangea is virtually disease free.